To build demand for and expand market presence and penetration of U.S. dairy products in the Middle East/North Africa region, USDEC conducted a first-ever U.S. 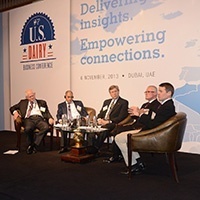 Dairy Business Conference in Dubai. The interactive forum attracted 101 high-prospect food and beverage industry decision-makers from nine countries in the region and 12 USDEC member companies. The conference topics focused on positioning the United States as a high quality, reliable and preferred supply source of dairy products. A roster of high-caliber speakers and panelists delivered comprehensive and actionable insights on the U.S. dairy industry's extensive and expanding portfolio of dairy products, such as cheese, whey ingredients, milk powders, butter and more.